In 1985, Scott Weiland met Robert DeLeo at a concert in Long Beach. For whatever reason, they struck up a conversation about the girls they were dating. As it turned out, both were dating the same girl. Instead of fighting over her, both decided to break it off with her and form a band. 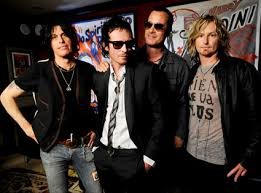 Thus was the beginning of Stone Temple Pilots, a band that remained virtually unchanged until 2013. The decision to shed Weiland was a difficult one. For DeLeo, Weiland represented an obstacle to having fun while making music. Weiland didn’t seem to care about his band mates, and decided to go his own route. In May of 2013, the band filed a lawsuit to compel Scott Weiland from using their name and performing their songs. Leading up to the filing, Weiland had reportedly fallen deeper into drugs and all but stopped showing up to rehearsal on time. Weiland responded with a counter suit alleging that the band had no right to remove him from the lineup. The legal issues are still up for debate. Chester Bennington of Linkin Park fame has been chosen to lead the band as singer while things with Weiland get sorted out. Chester’s choice isn’t one born of passion, necessarily. He claims that his role is meant to keep the band together, citing mounting bills and general costs the band members face with or without Weiland. Bennington has also stated that he understands what the band is going through, and that they were faced with a difficult decision. They are set to debut a new album called “High Rise,” which is due out in October of 2014. Art and music are basic human activities. Humankind can not really function without art and music. As humans we always strive to create things be they small or big. Also as humans we strive to create sound or get involved with sound in some way. People have always found meaning in music by playing, creating, listening to its emotions and to the challenges that it poses… Music, classical music in particular, has immense value for our society, whether it is known explicitly or not.It is however known worldwide that there is still a certain stigma that is attached to music by some people, it is not seen as a priority. Many people still believe for instance that classical music is for the rich, the old, or the educated. Even worse, the pretentiousness and elitism that some artists exhibit is amplified by television shows, commercials, plays, books, this distances musicians from society. While some of this stereotype may be near the truth, as with nearly any stereotype, it is not entirely true. Despite the influence that music has on society, the majority decide that music is not for them, simply because they believe it has no relevance. People need to believe that everyone can find enjoyment in music.The most common way one could involve himself or herself with music is by listening to or attending a concert. This is an experience that people can and do enjoy. It is also important because a concert venue creates a unique experience one can hardly find in any other place. Where else can one sit with other people and enjoy music in silence when there are no other distractions? There are so many things in music to which one can listen and bring attention. It is not only enjoyable but it stimulates and tickles the mind. One can call one’s attention to the melodies or to the themes, the harmony, the relaxing rhythms, the colour of the sounds, how the sounds are produced and how they all relate to each other, while trying to figure out how the composer contrived the piece. Classical music is not only pleasing to the ear and to the mind but it is also nurturing to the soul. It has been said that music has emotional value. Music affects one’s mood as it has many characteristics. Music in most cases makes people feel good and calm as well as evoking other emotional responses. It is the emotional response that draws most people to experience music. With classical music the listener has an array of options as to how to experience the music.Society at large can also experience music and can gain from it, in this case, music is usually experienced as a hobby. People play in community ensembles (orchestra, band, choir), take lessons, play, compose, and nearly do anything else a musician may do, while maintaining their regular lives. In general, to an amateur musician, music is important to him/her through enjoyment and through the thrill of playing or creating music and not having to commit the entire life to it. It is an important part of one’s life and fills a need or an urge to create music. Music can be a way of escape or a stress reliever as it can be for anyone.Through all levels of education music is extremely important. Students learn many important and necessary values for life as music challenges the mind. Learning to read music is learning a different language with abstract sonic meaning. One not only has to comprehend and decipher unique symbols on paper, one has to know how to execute them and execute them well. Those learning music also have to learn what sounds good and to develop a critical ear.With a critical ear, one knows how to practice, rehearse, analyze and to criticize a musicperformance. Also, performing music encompasses playing with others as well as alone which both necessitate certain skills. Also one can learn tremendously from studying/analyzing music, composing, reading about music, understanding the history of music and its association with historical and current trends, and knowing what to listen for in music.With all this, students of music, whether it be at the elementary, middle school, high school, at college level or studying alone, learn self discipline through study and practice. They develop technical motor skills, express themselves through sound and problem solving, cooperate and collaborate with others, ignite a creative mind, develop a critical mind that understands quality and taste, and most importantly understand that music has a lot to offer. Anyone who studies music learns some or all of these skills whether they know it or not. People who do not make a career in music but have studied it will take these skills and apply it elsewhere. Music is the only discipline in which obtaining varied skills is possible.It is a tragedy that in our society music is looked upon as an extra discipline that it is not essential to the function of our society and culture. It is usually regarded as a “fun” thing to do when one is not working and most people do not realize that one can experience and learn tremendous amount. It is up to us as artists and advocates of music to have people realize the importance of our discipline. With our society continually becoming more materialistic, superficial, quick to judge and with people not aware of its importance, it is possible that no one will be listening, no one will be watching, no one will be experiencing our art. People need to be shown the importance of our art and its value to them, especially those who have power to influence society. If society is shown the value of music, the arts will be better funded, better appreciated and will thrive even more. While the world of Internet radio is moving more and more toward the mainstream, it is still far more common to find AM or FM being broadcast inside a home or office. While analog radio can’t come close to matching the variety and scope of the free radio stations available for streaming over the Internet, consumers are still accustomed to turning a dial to pick up music, news, sports, and talk. Myine Electronics is looking to change that. Their Ira Wireless Internet Radio is designed to pick up Internet radio as opposed to analog radio. For consumers who are hesitant to adapt to new technology to listen to music, the Ira Wireless Internet Radio makes the transition as smooth and painless as possible. Myine Electronics has worked hard to keep the radio as easy to use as possible; this means that you won’t find it to be overloaded with features that you’ll never use. One of the most notable features of this wireless radio is that you are no longer required to use a computer to find the online radio stations that interest you. The initial setup is very simple––the company says that it only takes three minutes to set it up once you take it out of the box. It can be hooked up to your existing home sound system and has a small footprint: 6″ by 3″ by 2″. Beyonce has been named Billboard’s woman of the year. Billboard holds a Women In Music event every year and this year Beyonce will be honored on October 2nd in New York City. Billboard chooses the women in the music industry based on their success, leadership and new ideas. Beyonce is being awarded for accomplishments made over the past 12 months. Beyonce has been around for a while now, but her journey started long ago as a kid. Beyonce’s got started on her tour, “I am…”, in support of her third solo album, last year. Beyonce will be taking her tour to over 20 countries by the time the tour ends in November. Beyonce recognized the crisis in the auto industry and showed her generosity by giving away 2,500 tickets to families affected by the failing auto industry in Detroit. On top of that, she teamed up with Feeding America, and General Mills Hamburger helper to help deliver more than 3 million meals to local food banks. Her third album, “I am… Sasha Fierce”, debuted at No. 1 on Billboards top 200 chart in November. Beyonce worked on this last album for almost a year. Longer than any other album she previously worked on. Including those she worked diligently on with the former group Destiny’s Child. Out of the 51 year history that Billboard has with the Hot 100, Beyonce is the only artist to top the chart as a solo artist and as a part of a group for 10 weeks or longer. There is nothing quite like getting out with some friends and hitting up a summer music festival for to enjoy some of your favorite music and the camaraderie of fellow fans. However, these day or weekend long festivals often involve sitting out in an open field in the hot summer sun, and they require a little more preparation than your average concert. There’s no need to become camp counselor or the festival boss in order to keep things under control, but you are more likely to have a good time if you simply follow these seven tips to enjoying a summer music festival. First off, stay hydrated. Many festivals do not let you bring in outside beverages, so plan on shelling out some cash for cold refreshments. Next, be sure to bring sun protection; you can get burned surprisingly easily during a day in the sun at a festival. This means hats, adequate clothing and sunscreen. On the other hand, it also helps to plan for rain. A big thunderstorm can be dangerous in the open field of a major summer music festival, so follow basic safety precautions . The fourth tip is to have a back up plan. The show might get canceled because of rain, sick band members or any number of reason, and you want a fun alternative if the show is a washout other than moping in some roadside diner. Also, be sure to pace yourself if you decide to drink alcohol at the festival. You are going to be their all day, so save the beers for the headlining acts once the sun goes down so that you can actually enjoy the show. Unless you are unhealthy or really want to be up front, consider just going with regular admittance tickets instead of the more expensive seats with actual chairs. Show up early enough to find a nice spot to make camp and bring your own folding chairs to enjoy the show on the lawn amongst your fellow fans. Internet radio continues to encroach on the space once occupied by terrestrial radio, reportsRadio World. According to the article “Radio’s Last Fortress Under Siege,” the dramatic growth in deployment and penetration of residential broadband Internet access was largely responsible for this attack. Now, instead of limiting radio listening to the workplace or car, people can listen to it at home. Another reason for this invasion, according to the article, is that Wi-Fi gave Webcasting more freedom in terms of around the house, at work, and other commercial spaces. Now broadband wireless WANs, such as 3G services and devices, have made listening to music online portable for the first time. The final step to making Internet radio completely portable is having it available in the car. The following are some examples of future and current technology that can do just that. The first invention would be the creation of in-dash hardware units that add wireless broadband capabilities to the car audio system; although both radio professionals and consumers agree that it may take years before this can be developed. The second more practical possibility is using an iPod/Phone dock in the car. In fact, according to the article , the most recent iPhone 3G S makes it easier to listen to Internet radio in the car.